A pair of researchers with Institut Universitaire de France has found more evidence of a large evaporative event in the moon’s past. In their paper published on the open access site Science Advances, Chizu Kato and Frédéric Moynier describe their study of gallium isotopes from lunar samples, what they found, and why they believe it sheds some light on how the moon was formed. The prevailing theory by astronomers who study the moon is that it was created by a celestial body slamming into the Earth, flinging debris into space. That debris, they believe, eventually coalesced into what is now the moon. That theory depends on samples of lunar rocks and soil matching material found on Earth. However, some isotope amounts, especially the lighter ones, do not match well with those found on Earth, which means they either originated elsewhere, or something caused a change in their original amounts. Many scientists agree with the latter theory, as do Kato and Moynier. They, like many of their colleagues, believe that for a period of time after it was formed, the moon was so hot it was completely covered in magma. They suggest this caused many of the lighter isotopes to evaporate into space. To back up their theory, researchers have studied isotopes of elements such as potassium and zinc found in lunar rocks. They compare the ratio of those that are heavier with those here on Earth to learn more about how much of the lighter ones may have been lost to evaporation and the events that could have led to the differences. In this new effort, the researchers looked at the gallium isotope in moon samples and found that its low boiling point, its resilience to evaporation during magmatic events and other characteristics suggest that the differences in amounts of gallium on the moon versus the Earth could, indeed, be explained by a huge evaporative event—such as hot magma covering the surface of the moon. 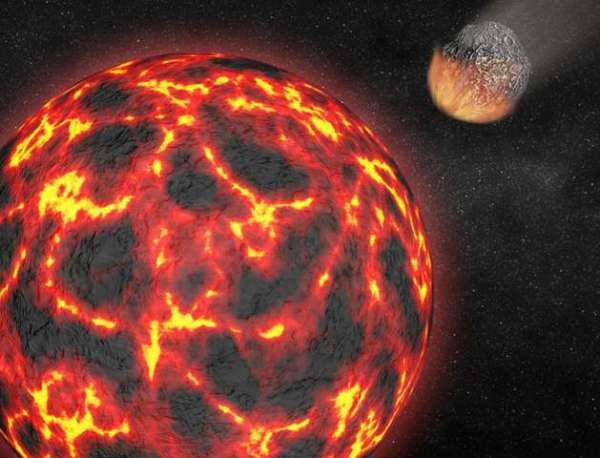 This finding bolsters the theory that the moon was created by something colliding with the Earth.